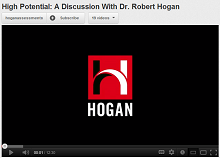 High Potential: A Discussion With Dr. Robert Hogan. What defines a high-potential candidate? What is the difference between employability and high-potential? How should companies handle employees who are not designed as having high-potential? The Hogan SafeSystem model provides the tools necessary to build and maintain a culture of safe working practices. The three components of the SafeSystem are: The SafeSystem Climate Survey provides feedback regarding the perceptions of safety at all levels of the organization and results in a company-wide safety score. 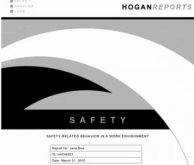 The Hogan Safety Assessment evaluates employees and job applicants in terms of six safety-related competencies and provides valuable information for helping them develop safer work behaviors. The SafeSystem Coaching Process provides leadership with the data-based feedback needed to build and maintain a culture of safe working practices. The fact that this test consists of a mostly non-verbal task, of moving images and the obvious connection to practical activities makes it work even for those respondents, who tend to have a negative opinion about tests with a „typically school-like" content. Hogan ThinkBox is a premier online leadership resource, incorporating results from the Hogan Personality Inventory and the Hogan Development Survey. Build on your strengths, explore potential limitations, and maximize your career potential with our customized coaching and development tools. Hogan ThinkBox is a library of learning resources providing just-in-time, powerful tools for today’s busy employee. ThinkBox is relevant and succinct–distilling expert advice, experience, and templates into hundreds of engaging, to-the-point development resources that work in concert with an individual’s HPI and HDS results. The entire library is easily tailored to your organization’s competencies, providing your people with relevant resources, right now.